The AC power supply from shore generator or inverter has to be perfectly managed for safety and to ensure your valuable equipment remains undamaged. 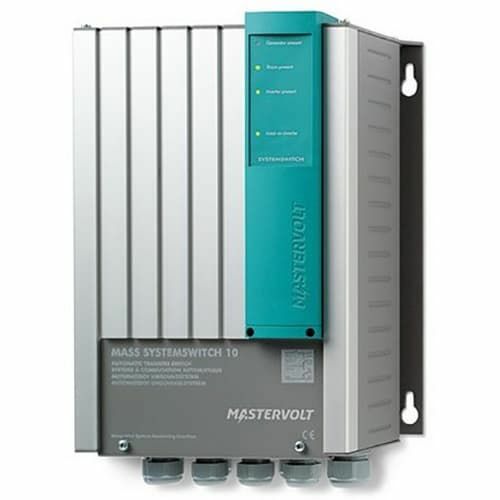 Mastervolt gives you the option to switch automatically between available power sources. The Masterswitch will connect the output to the highest priority input if available. Combinating power sources becomes possible for high power consumption situations such as when you want to do the laundry and cook at the same time with a limited shore or generator power supply. Achieving this is simple by using this lightweight (5 kg) Mass Systemswitch (16 kW) which functions as junction in your 230 V on board system and has four outputs. The Mass Systemswitch offers the safety you need. Even more comfort is obtained by connecting it to one of four advanced Mastervolt remote panels with extended monitoring and control possibilities. The simple and effective solution!